Belt clips are located on each of the outer seats on the second row of seats. They prevent the belt from twisting, thus preventing damage to the seat belt and to the side trim. If the seat belt has been unfastened, the belt clip must always be at the same height as the top of the backrest. If the seat belt has been fastened, the position is variable. 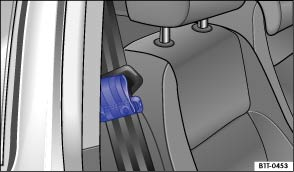 When using a group I child seat, the belt clip must be pushed up as far as it will go.